Ayman Mohammed Rabie al-Zawahiri (Arabic: أيمن محمد ربيع الظواهري‎ ʾAyman Muḥammad Rabīʿ aẓ-Ẓawāhirī; born June 19, 1951) is the current leader of al-Qaeda and a current or former member and senior official of Islamist organizations which have orchestrated and carried out attacks in North America, Asia, Africa, and the Middle East. In 2012, he called on Muslims to kidnap Western tourists in Muslim countries. Since the September 11 attacks, the U.S. State Department has offered a US$25 million reward for information or intelligence leading to al-Zawahiri's capture. He is under worldwide sanctions by the Al-Qaida Sanctions Committee as a member of al-Qaeda. Ayman Mohammed Rabie al-Zawahiri is pronounced [ˈʔæjmæn mʊˈħæmːæd rɑˈbiːʕ azˤːɑˈwæːhɪriː] or [aðˤːɑˈwæːhɪriː] in Arabic. Zawahiri is usually spelled Zawahri (from the pronunciation in his native Egyptian Arabic), but is sometimes spelled "Dhawahri" if transliterated directly from Modern Standard Arabic, also called Literary Arabic, in certain academic circles. Using the Intelligence Community Standard for the Transliteration of Arabic Names, it is spelled Zawahri. Al-Zawahiri has also gone under following names: Abu Muhammad / Abu Mohammed (أبو محمّد), Abu Fatima (أبو فاطمة), Muhammad Ibrahim (محمّد إبراهيم), Abu Abdallah (أبو عبدالله), Abu al-Mu'iz (أبو المعز), The Doctor, The Teacher, Nur (نور), Ustaz (أستاذ), Abu Mohammed Nur al-Deen (أبو محمّد نورالدين), Abdel Muaz / Abdel Moez / Abdel Muez (عبدالمعز). Ayman al-Zawahiri was born in 1951 in the neighborhood of Maadi, Cairo, in the then Kingdom of Egypt, to Mohammed Rabie al-Zawahiri and Umayma Azzam. The al-Zawahiri family was considered "distinguished"  while they lived in Maadi. Al-Zawahiri's parents both came from prosperous families. Al-Zawahiri's father, Mohammed Rabie al-Zawahiri, came from a large family of doctors and scholars. Mohammed Rabie became a surgeon and a professor of pharmacy at Cairo University. Ayman's mother, Umayma Azzam, came from a wealthy, politically active clan, being the daughter of Abdel-Wahhab Azzam, a literary scholar who served as the president of Cairo University, the founder and inaugural rector of the King Saud University (the first university in Saudi Arabia) as well as ambassador to Pakistan, while his own brother was Azzam Pasha, the founding secretary-general of the Arab League (1945-1952). From his maternal side yet another relative was Salem Azzam, an Islamist intellectual and activist, for a time secretary-general of the Islamic Council of Europe based in London. He also has a maternal link to the house of Saud : Muna, the daughter of Azzam Pasha (his maternal great-uncle), is married to Mohammed bin Faisal Al Saud, the son of the late king Faisal. Ayman has said that he has a deep affection for his mother. Her brother, Mahfouz Azzam, became a role model for Ayman as a teenager. Ayman has a younger brother, Muhammad al-Zawahiri, and a twin sister, Heba Mohamed al-Zawahiri. Al-Zawahiri's sister, Heba Mohamed al-Zawahiri, became a professor of medical oncology at the National Cancer Institute, Cairo University. She described her brother as "silent and shy". Al-Zawahiri's brother, Muhammad al-Zawahiri, was sent to the Balkans by his older brother in 1993. Ayman al-Zawahiri sent Muhammad to meet with Alija Izetbegović, commander of the 3rd Corps of the Army of the Republic of Bosnia and Herzegovina, along with senior staff officers attached and religious leaders, to check the Islamisation of the Bosnian Army and the funds received for the mujahedeen fighters in Bosnia. [unreliable source?] Muhammad was known as a logistics expert and is said to be the military commander of Islamic Jihad. Muhammad worked in Bosnia, Croatia, and Albania under the cover of being an International Islamic Relief Organization (IIRO) official. While hiding in the United Arab Emirates, he was arrested in 2000, then extradited to Egypt, where he was sentenced to death. He was held in Tora Prison in Cairo as a political detainee. Security officials said he was the head of the Special Action Committee of Islamic Jihad, which organized terrorist operations. However, after the Egyptian popular uprising in the spring of 2011, on March 17, 2011, he was released from prison by the Supreme Council of the Armed Forces, the interim government of Egypt. His lawyer said he had been held to extract information about his brother Ayman. However, on March 20, 2011, he was re-arrested. On August 17, 2013, Egyptian authorities arrested Muhammad al-Zawahiri at his home in Giza. Ayman al-Zawahiri was reportedly a studious youth. Ayman excelled in school, loved poetry, and "hated violent sports" — which he thought were "inhumane." Al-Zawahiri studied medicine at Cairo University and graduated in 1974 with gayyid giddan. Following that, he served three years as a surgeon in the Egyptian Army after which he established a clinic near his parents in Maadi. In 1978, he also earned a master's degree in surgery. Ayman al-Zawahiri has also shown a radical understanding of Islamic theology and Islamic history. He speaks Arabic, English, and French. Al-Zawahiri participated in Youth activism as a student. He became both quite pious and political, under the influence of his uncle Mahfouz Azzam, and lecturer Mostafa Kamel Wasfi.Sayyid Qutb preached that to restore Islam and free Muslims, a vanguard of true Muslims modeling itself after the original Companions of the Prophet had to be developed. By the age of 14, al-Zawahiri had joined the Muslim Brotherhood. The following year the Egyptian government executed Qutb for conspiracy, and al-Zawahiri, along with four other secondary school students, helped form an "underground cell devoted to overthrowing the government and establishing an Islamist state." It was at this early age that al-Zawahiri developed a mission in life, "to put Qutb's vision into action." His cell eventually merged with others to form al-Jihad or Egyptian Islamic Jihad. Ayman al-Zawahiri has been married at least four times. His wives include Azza Ahmed Nowari and Umaima Hassan. In 1978, al-Zawahiri married his first wife, Azza Ahmed Nowari, a student at Cairo University who was studying philosophy. Their wedding, which was held at the Continental Hotel in Opera Square, was very conservative, with separate areas for both men and women, and no music, photographs, or light-hearted humour. Many years later, when the United States attacked Afghanistan following the September 11 attacks in October 2001, Azza apparently had no idea that al-Zawahiri had supposedly been a jihadi emir (commander) for the last decade. In June 2012, one of Zawahiri's four wives, Umaima Hassan, released a statement on the internet congratulating the role played by Muslim women in the Arab Spring. Al-Zawahiri and his wife, Azza, had four daughters, Fatima (born 1981), Umayma (born 1983), Nabila (born 1986), and Khadiga (born 1987), and a son, Mohammed (also born in 1987; the twin brother of Khadiga), who was a "delicate, well-mannered boy" and "the pet of his older sisters," subject to teasing and bullying in a traditional all-male environment, who preferred to "stay at home and help his mother." In 1997, ten years after the birth of Mohammed, Azza gave birth to their fifth daughter, Aisha, who had Down syndrome. In February 2004, Abu Zubaydah was waterboarded and subsequently stated that Abu Turab Al-Urduni had married one of al-Zawahiri's daughters. In the first half of 2005, one of Al-Zawahiri's three surviving wives gave birth to a daughter, named Nawwar. Ayman al-Zawahiri's first wife Azza and two of their six children, Mohammad and Aisha, were killed in an air strike on Afghanistan by US forces in late December 2001, following the September 11 attacks on the U.S. After an American aerial bombardment of a Taliban-controlled building at Gardez, Azza was pinned under debris of a guesthouse roof. Concerned for her modesty, she "refused to be excavated" because "men would see her face" and she died from her injuries the following day. Her son, Mohammad, was also killed outright in the same house. Her four-year-old daughter with Down syndrome, Aisha, had not been hurt by the bombing, but died from exposure in the cold night while Afghan rescuers tried to save Azza. Ayman al-Zawahiri worked in the medical field as a surgeon. In 1985, al-Zawahiri went to Saudi Arabia on Hajj and stayed to practice medicine in Jeddah for a year. As a reportedly qualified surgeon, when his organization merged with bin Laden's al-Qaeda, he became bin Laden's personal advisor and physician. He had first met bin Laden in Jeddah in 1986. In 1981, Ayman al-Zawahiri also traveled to Peshawar, Pakistan, where he worked in a Red Crescent hospital treating wounded refugees. There he became friends with Ahmed Khadr, and the two shared a number of conversations about the need for Islamic government and the needs of the Afghan people. In 1993, al-Zawahiri traveled to the United States, where he addressed several California mosques under his Abdul Mu'iz pseudonym, relying on his credentials from the Kuwaiti Red Crescent to raise money for Afghan children who had been injured by Soviet land mines—he only raised $2000. In 1981, Al-Zawahiri was one of hundreds arrested following the assassination of President Anwar Sadat. Initially, the plan was derailed when authorities were alerted to Al-Jihad's plan by the arrest of an operative carrying crucial information, in February 1981. President Sadat ordered the roundup of more than 1500 people, including many Al-Jihad members, but missed a cell in the military led by Lieutenant Khalid Islambouli, who succeeded in assassinating Sadat during a military parade that October. His lawyer, Montasser el-Zayat, said that Zawahiri was tortured in prison. In his book, Al-Zawahiri as I Knew Him, Al-Zayat maintains that under torture by the Egyptian police, following his arrest in connection with the murder of Sadat in 1981, Al-Zawahiri revealed the hiding place of Essam al-Qamari, a key member of the Maadi cell of al-Jihad, which led to Al-Qamari's "arrest and eventual execution." In 1993, al-Zawahiri's and Egyptian Islamic Jihad's (EIJ) connection with Iran may have led to a suicide bombing in an attempt on the life of Egyptian Interior Minister Hasan al-Alfi, the man heading the effort to quash the campaign of Islamist killings in Egypt. It failed, as did an attempt to assassinate Egyptian prime minister Atef Sidqi three months later. The bombing of Sidqi's car injured 21 Egyptians and killed a schoolgirl, Shayma Abdel-Halim. It followed two years of killings by another Islamist group, al-Gama'a al-Islamiyya, that had killed over 200 people. Her funeral became a public spectacle, with her coffin carried through the streets of Cairo and crowds shouting, "Terrorism is the enemy of God!" The police arrested 280 more of al-Jihad's members and executed six. For their leading role in anti-Egyptian Government attacks in the 1990s, al-Zawahiri and his brother Muhammad al-Zawahiri were sentenced to death in the 1999 Egyptian case of the Returnees from Albania. In July 2007, Al-Zawahiri supplied direction for the Lal Masjid siege, codename Operation Silence. This was the first confirmed time that Al-Zawahiri was taking militant steps against the Pakistan Government and guiding Islamic militants against the State of Pakistan. The Pakistan Army troops and Special Service Group taking control of the Lal Masjid ("Red Mosque") in Islamabad found letters from al-Zawahiri directing Islamic militants Abdul Rashid Ghazi and Abdul Aziz Ghazi, who ran the mosque and adjacent madrasah. This conflict resulted in 100 deaths. On December 27, 2007, al-Zawahiri was also implicated in the assassination of former Pakistani Prime Minister Benazir Bhutto. In 1994, the sons of Ahmad Salama Mabruk and Mohammed Sharaf were executed under al-Zawahiri's leadership for betraying Egyptian Islamic Jihad; the militants were ordered to leave the Sudan. In 1998, Ayman al-Zawahiri was listed as under indictment in the United States for his role in the 1998 U.S. embassy bombings, a series of attacks that occurred on August 7, 1998, in which hundreds of people were killed in simultaneous truck bomb explosions at the United States embassies in the major East African cities of Dar es Salaam, Tanzania and Nairobi, Kenya. The attacks brought Osama bin Laden and Ayman al-Zawahiri to international attention. On October 10, 2001, al-Zawahiri appeared on the initial list of the U.S. Federal Bureau of Investigation's top 22 Most Wanted Terrorists, which was released to the public by U.S. President George W. Bush. In early November 2001, the Taliban government announced they were bestowing official Afghan citizenship on him, as well as Bin Laden, Mohammed Atef, Saif al-Adl, and Shaykh Asim Abdulrahman. Ayman al-Zawahiri was previously the second and last "emir" of the Egyptian Islamic Jihad, having succeeded Abbud al-Zumar in the latter role when Egyptian authorities sentenced al-Zumar to life imprisonment. Ayman al-Zawahiri eventually became one of Egyptian Islamic Jihad's leading organizers and recruiters. Zawahiri's hope was to recruit military officers and accumulate weapons, waiting for the right moment to launch "a complete overthrow of the existing order." Chief strategist of Al-Jihad was Aboud al-Zumar, a colonel in the military intelligence whose plan was to kill the main leaders of the country, capture the headquarters of the army and State Security, the telephone exchange building, and of course the radio and television building, where news of the Islamic revolution would then be broadcast, unleashing – he expected – "a popular uprising against secular authority all over the country." In Peshawar, he met up with Osama bin Laden, who was running a base for mujahideen called Maktab al-Khadamat (MAK); founded by the Palestinian Sheikh Abdullah Yusuf Azzam. The radical position of al-Zawahiri and the other militants of Al-Jihad put them at odds with Sheikh Azzam, with whom they competed for bin Laden's financial resources. Zawahiri carried two false passports, a Swiss one in the name of Amin Uthman and a Dutch one in the name of Mohmud Hifnawi. British journalist Jason Burke wrote: "Al-Zawahiri ran his own operation during the Afghan war, bringing in and training volunteers from the Middle East. Some of the $500 million the CIA poured into Afghanistan reached his group." Former FBI agent Ali Soufan mentioned in his book The Black Banners that Ayman al-Zawahiri is suspected of being behind Azzam's assassination in 1989. This image used by the FBI shows Ayman al-Zawahiri in Khost, Afghanistan. In 1998, al-Zawahiri formally merged the Egyptian Islamic Jihad into al-Qaeda. According to reports by a former al-Qaeda member, he has worked in the al-Qaeda organization since its inception and was a senior member of the group's shura council. He was often described as a "lieutenant" to Osama bin Laden, though bin Laden's chosen biographer has referred to him as the "real brains" of al-Qaeda. On February 23, 1998, al-Zawahiri issued a joint fatwa with Osama bin Laden under the title "World Islamic Front Against Jews and Crusaders". Zawahiri, not bin Laden, is thought to have been the actual author of the fatwa. Bin Laden and al-Zawahiri organized an al-Qaeda congress on June 24, 1998. A week prior to the beginning of the conference, a group of well-armed assistants to al-Zawahiri had left by jeeps in the direction of Herat. Following the instructions of their patron, in the town of Koh-i-Doshakh, they met three unknown Slavic-looking men who had arrived from Russia via Iran. After their arrival in Kandahar, they split up. One of the Russians was directly escorted to al-Zawahiri and he did not participate in the conference. Western military intelligence succeeded in acquiring photographs of him, but he disappeared for six years. According to Axis Globe, in 2004, when Qatar and the U.S. investigated Russian embassy officials whom the United Arab Emirates had arrested in connection to the murder of Zelimkhan Yandarbiyev in Qatar, computer software precisely established that a man who had walked to the Russian embassy in Doha was the same one who visited al-Zawahiri prior to the Al-Qaida conference. On April 30, 2009, the U.S. State Department reported that al-Zawahiri had emerged as al-Qaeda's operational and strategic commander and that Osama bin Laden was now only the ideological figurehead of the organization. However, after the 2011 death of bin Laden, a senior U.S. intelligence official was quoted as saying intelligence gathered in the raid showed that bin Laden remained deeply involved in planning: "This compound (where bin Laden was killed) in Abbottabad was an active command-and-control center for al-Qaeda's leader. He was active in operational planning and in driving tactical decisions within al-Qaeda." Following the death of bin Laden, former U.S. Deputy National Security Advisor for Combating Terrorism Juan Zarate said that al-Zawahiri would "clearly assume the mantle of leadership" of al-Qaeda. However, a senior U.S. administration official said that although al-Zawahiri was likely to be al-Qaeda's next leader, his authority was not "universally accepted" among al-Qaeda's followers, particularly in the Gulf region. Zarate said that al-Zawahiri was more controversial and less charismatic than bin Laden. Rashad Mohammad Ismail (AKA "Abu Al-Fida"), a leading member of al-Qaeda in the Arabian Peninsula, stated that al-Zawahiri was the best candidate. Hamid Mir is reported to have said that he believed that Ayman al-Zawahiri was the operational head of al-Qaeda, and that "[h]e is the person who can do the things that happened on September 11." Within days of the attacks, Zawahiri's name was put forward as bin Laden's second-in-command, with reports suggesting he represented "a more formidable US foe than bin Laden." As of 2 May 2011[update], he became the leader of al-Qaeda following the death of Osama bin Laden. This was confirmed by a press release from al-Qaeda's general command on June 16. Al-Zawahiri's succession to command of al-Qaeda was announced on several of their websites on June 16, 2011. On the same day, al-Qaeda renewed its position that Israel was an illegitimate state and that it wouldn't accept any compromise on Palestine. The delayed announcement led some analysts to speculate that there was quarreling within al-Qaeda: "It doesn't suggest a vast reservoir of accumulated goodwill for him," said one celebrity journalist on CNN. Both U.S. Secretary of Defense Robert Gates and Chairman of the Joint Chiefs of Staff Mike Mullen maintain that the delay didn't signal any kind of dispute within al-Qaeda, and Mullen reiterated U.S. death threats toward al-Zawahiri. According to U.S. officials within the Obama administration and Robert Gates, al-Zawahiri would find the leadership difficult as, while intelligent, he lacks combat experience and the charisma of Osama bin Laden. On December 1, 1996, Ahmad Salama Mabruk and Mahmud Hisham al-Hennawi – both carrying false passports – accompanied al-Zawahiri on a trip to Chechnya, where they hoped to re-establish the faltering Jihad. Their leader was traveling under the pseudonym Abdullah Imam Mohammed Amin, and trading on his medical credentials for legitimacy. The group switched vehicles three times, but were arrested within hours of entering Russian territory and spent five months in a Makhachkala prison awaiting trial. The trio pleaded innocence, maintaining their disguise and having other al-Jihad members from Bavari-C send the Russian authorities pleas for leniency for their "merchant" colleagues who had been wrongly arrested; and Russian Member of Parliament Nadyr Khachiliev echoed the pleas for their speedy release as al-Jihad members Ibrahim Eidarous and Tharwat Salah Shehata traveled to Dagestan to plead for their release. Shehata received permission to visit the prisoners, and is believed to have smuggled them $3000 which was later confiscated from their cell, and to have given them a letter which the Russians didn't bother to translate. In April 1997, the trio were sentenced to six months, and were subsequently released a month later and ran off without paying their court-appointed attorney Abulkhalik Abdusalamov his $1,800 legal fee citing their "poverty". Shehata was sent on to Chechnya, where he met with Ibn Khattab. During this time, al-Zawahiri also began reconstituting the Egyptian Islamic Jihad (EIJ) along with other exiled militants. The group had "very loose ties to their nominal imprisoned leader, Abud al-Zumur." In Peshwar, al-Zawahiri is thought to have become radicalized by other Al-Jihad members, abandoning his old strategy of a swift coup d'état to change society from above, and embracing the idea of takfir. In 1991, EIJ broke with al-Zumur, and al-Zawahiri grabbed "the reins of power" to become EIJ leader. However, in public Zawahiri has harshly denounced the Iranian government. In December 2007 he said, "We discovered Iran collaborating with America in its invasions of Afghanistan and Iraq." In the same video messages, he moreover chides Iran for "repeating the ridiculous joke that says that al-Qaida and the Taliban are agents of America," before playing a video clip in which Ayatollah Rafsanjani says, "In Afghanistan, they were present in Afghanistan, because of Al-Qa'ida; and the Taliban, who created the Taliban? America is the one who created the Taliban, and America's friends in the region are the ones who financed and armed the Taliban." Despite Iran's repetition of the slogan 'Death to America, death to Israel,' we haven't heard even one Fatwa from one Shiite authority, whether in Iran or elsewhere, calling for Jihad against the Americans in Iraq and Afghanistan. Zawahiri has dismissed that there is any cooperation between Iran and Al Qaeda against their common enemy, viz, the United States. He also said that "Iran Stabbed a Knife into the Back of the Islamic Nation." In April 2008, Zawahiri blamed Iranian state media and Al-Manar for perpetuating the "lie" that "there are no heroes among the Sunnis who can hurt America as no-one else did in history" in order to discredit the Al Qaeda network. Zawahiri was referring to some 9/11 conspiracy theories according to which Al Qaeda was not responsible for the 9/11 attacks. On the seventh anniversary of the attacks of September 11, 2001, Zawahiri released a 90-minute tape in which he blasted "the guardian of Muslims in Tehran" for recognizing "the two hireling governments" in Iraq and Afghanistan. There have been doubts as to the true nature of al-Zawahiri's encounter with the Russians in 1996. Washington, D.C.-based Jamestown Foundation scholar Evgenii Novikov has argued that it seems unlikely that the Russians would not have been able to determine who he was, given their well-trained Arabists and the obviously suspicious act of Muslims crossing illegally a border with multiple false identities and encrypted documents in Arabic. Assassinated former FSB secret service officer Alexander Litvinenko alleged, among other things, that during this time, al-Zawahiri was indeed being trained by the FSB, and that he was not the only link between al-Qaeda and the FSB. Former KGB officer, speaker on the Voice of America and writer Konstantin Preobrazhenskiy supported Litvinenko's claim and said that Litvinenko "was responsible for securing the secrecy of Al-Zawahiri's arrival in Russia, who was trained by FSB instructors in Dagestan, Northern Caucasus, during 1996–1997." While there Zawahiri learned of a "Nonviolence Initiative" being organized in Egypt to end the terror campaign that had killed hundreds and resulting government crackdown that had imprisoned thousands. Zawahiri angrily opposed this "surrender" in letters to the London newspaper Al-Sharq al-Awsat. Together with members of al-Gama'a al-Islamiyya, he helped organize a massive attack on tourists at the Temple of Hatshepsut to sabotage the initiative by provoking the government into repression. The people of Egypt consider the presence of these foreign tourists to be aggression against Muslims and Egypt... The young men are saying that this is our country and not a place for frolicking and enjoyment, especially for you. The massacre was so unpopular that no terror attacks occurred in Egypt for several years thereafter. [clarification needed] Zawahiri was sentenced to death in absentia in 1999 by an Egyptian military tribunal. In December 2001, al-Zawahiri published a book entitled Fursan That Rayal al Nabi (Knights Under the Prophet's Banner) which outlined ideologies of al-Qaeda. English translations of this book were published; excerpts are available online. ...The second power depends on God alone, then on its wide popularity and alliance with other jihad movements throughout the Islamic nation, from Chechnya in the north to Somalia in the south and from "Eastern Turkestan in the east to Morocco in the west. ...It seeks revenge against the gang-leaders of global unbelief, the United States, Russia, and Israel. It demands the blood price for the martyrs, the mothers' grief, the deprived orphans, the suffering prisoners, and the torments of those who are tortured everywhere in the Islamic lands―from Turkistan in the east to Andalusia. ...It also gave young Muslim mujahidin―Arabs, Pakistanis, Turks, and Muslims from Central and East Asia―a great opportunity to get acquainted with each other on the land of Afghan jihad through their comradeship-at-arms against the enemies of Islam. Al-Qaeda leader Ayman al-Zawahiri (2001) in Knights Under the Prophet's Banner which was released by Al-Sharq Al-Awsat. 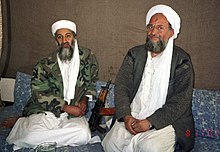 Osama bin Laden sits with his adviser al-Zawahiri during an interview with Pakistani journalist Hamid Mir, in November 2001. Following the U.S. invasion of Afghanistan, al-Zawahiri's whereabouts are unknown, but he is generally thought to be in tribal Pakistan. Although he releases videos of himself frequently (see Messages of Ayman al-Zawahiri), al-Zawahiri did not appear alongside bin Laden in any of them after 2003. In 2003, it was rumored that he was under arrest in Iran, although this was later discovered to be false. In 2004, the Pakistan Army launched an aggressive operation in Wana, Pakistan. Reports began to surface that he was trapped in the center of the conflict by the army. But when, after weeks of fighting, the army captured the area, it was later revealed that he either escaped or was never among the fighters. As the conflict spread into the tribal areas of western Pakistan, Ayman al-Zawahiri became a prime target of the ISI's Directorate for Joint Counterintelligence Bureau (J-COIN Bureau). However, despite a series of operations they were unable to capture him. On January 13, 2006, the Central Intelligence Agency, aided by Pakistan's ISI, launched an airstrike on Damadola, a Pakistani village near the Afghan border where they believed al-Zawahiri was located. The airstrike was supposed to kill al-Zawahiri and this was reported in international news over the following days. Many victims of the airstrike were buried without being identified. Anonymous U.S. government officials claimed that some terrorists were killed and the Bajaur tribal area government confirmed that at least four terrorists were among the dead. Anti-American protests broke out around the country and the Pakistani government condemned the U.S. attack and the loss of innocent life. On January 30, a new video was released showing al-Zawahiri unhurt. The video discussed the airstrike, but did not reveal if al-Zawahiri was present in the village at that time. On August 1, 2008, CBS News reported that it had obtained a copy of an intercepted letter dated July 29, 2008, from unnamed sources in Pakistan, which urgently requested a doctor to treat al-Zawahiri. The letter indicated that al-Zawahiri was critically injured in a US missile strike at Azam Warsak village in South Waziristan on July 28 that also reportedly killed al Qaeda explosives expert Abu Khabab al-Masri. Taliban Mehsud spokesman Maulvi Umar told the Associated Press on August 2, 2008, that the report of al-Zawahiri's injury was false. In early September 2008, Pakistan Army claimed that they "almost" captured al-Zawahiri after getting information that he and his wife were in the Mohmand Agency, in northwest Pakistan. After raiding the area, officials didn't find him. In June 2013, al-Zawahiri arbitrated against the merger of the Islamic State of Iraq with the Syrian-based Jabhat al-Nusra into Islamic State of Iraq and the Levant as was declared in April by Abu Bakr al-Baghdadi. Abu Mohammad al-Julani, leader of al-Nusra Front, affirmed the group's allegiance to al-Qaeda and al-Zawahiri. In September 2015, Zawahiri urged Islamic State (ISIL) to stop fighting al-Nusra Front, the official al-Qaeda affiliate in Syria, and to unite with all other jihadists against the supposed alliance between America, Russia, Europe, Shiites and Iran, and Bashar al-Assad's Alawite regime. Ayman al-Zawahiri released a statement supporting jihad in Xinjiang against Chinese, jihad in the Caucasus against the Russians and naming Somalia, Yemen, Syria, Iraq and Afghanistan as battlegrounds. Zawahiri endorsed "jihad to liberate every span of land of the Muslims that has been usurped and violated, from Kashgar to Andalusia, and from the Caucasus to Somalia and Central Africa". Uyghurs inhabit Kashgar, the city which was mentioned by Zawahiri. In another statement he said, "My mujahideen brothers in all places and of all groups ... we face aggression from America, Europe, and Russia ... so it's up to us to stand together as one from East Turkestan to Morocco". In 2015, the Turkistan Islamic Party (East Turkistan Islamic Movement) released an image showing Al Qaeda leaders Ayman al Zawahiri and Osama Bin Laden meeting with Hasan Mahsum. The Uyghurs East Turkestan independence movement was endorsed in the serial "Islamic Spring"'s 9th release by Al-Zawahiri. Zawahiri confirmed that the Afghanistan war after 9/11 included the participation of Uighurs and that the jihadists like Zarwaqi, Bin Ladin and the Uyghur Hasan Mahsum were provided with refuge together in Afghanistan under Taliban rule. Uyghur fighters were praised by Zawahiri, before a Turkistan Islamic Party performed a Bishkek bombing on 30 August. Uighur jihadists were hailed by Ayman al-Zawahiri. Doğu Türkistan Bülteni Haber Ajansı reported that the Uyghur Turkistan Islamic Party was praised by Abu Qatada along with Abdul Razzaq al Mahdi, Maqdisi, Muhaysini and Zawahiri. Abu Muhammad al-Maqdisi and Abu Qatada were referenced by Muhaysini. Al-Qaeda leaders Osama bin Laden and Ayman al Zawahiri were lauded by Muhaysini. Presently, the Rewards for Justice Program of the U.S. Department of State is offering a reward of up to US$25 million for information about his location. In a lengthy treatise titled "Loyalty and Enmity", Zawahiri argues that Muslims must at all times be loyal to Islam and to one another, while hating or at least being clean from everything and everyone outside of Islam. Zawahiri has said in an interview that the group does not have women combatants and that a woman's role is limited to caring for the homes and children of al-Qaeda fighters. This resulted in a debate regarding the role of mujahid women like Sajida Mubarak Atrous al-Rishawi. Zawahiri places supreme importance on winning public support, and castigated Abu Musab al-Zarqawi in this regard: "In the absence of this popular support the Islamic mujahid movement would be crushed in the shadows." May 2003: Tape was broadcast by al-Jazeera and included the directives (interpreted) "Raze/Singe the floor out from under their feet ... the political and corporate interests of the United States ... and Norway", which caused a global lockdown and extensive confusion for Norway. Early September 2003: A video showing al-Zawahiri and bin Laden walking together, as well as an audiotape, is released to the al-Jazeera network. September 9, 2004: Another video is released announcing more assaults. August 4, 2005: al-Zawahiri issues a televised statement blaming Tony Blair and his government's foreign policy for the July 2005 London bombings. September 1, 2005: al-Jazeera broadcasts a video message from Mohammed Sidique Khan, one of bombers of the London Underground. His message is followed by another message from al-Zawahiri, blaming again Tony Blair for the 7/7 bombings. September 19, 2005: al-Zawahiri claims responsibility for the London bombings and dismisses U.S. efforts in Afghanistan. December 7, 2005: The full 40-minute interview from September is posted on the Internet with previously unseen video footage. See below for links. April 3, 2008: al-Zawahiri said that al-Qaeda doesn't kill innocents and that its [former] leader Osama bin Laden is healthy. The questions asked his views about Egypt and Iraq, as well as Hamas. April 22, 2008: An audio interview in which, among other subjects, al-Zawahiri attacks the Shiite Iran and Hezbollah for blaming the 9/11 attacks on Israel, and thus discrediting al-Qaeda. On the 7th anniversary of the attacks of September 11, 2001, al-Zawahiri released a 90-minute tape, in which he blasted "the guardian of Muslims in Tehran" for "the two hireling governments" in Iraq and Afghanistan. January 7, 2009: An audio message released, where al-Zawahiri vows revenge for Israel's air and ground assault on Gaza and calls the Jewish state's actions against Hamas militants "a gift" from U.S. President-elect Barack Obama for the recent uprising conflict in Gaza. June 2, 2009: Audio messages claiming that Barack Obama is not welcome in Egypt. July 15, 2009: al-Zawahiri urges Pakistanis to support the Taliban. October 4, 2009: The New York Times reported that al-Zawahiri had asserted that Libya had tortured Ibn Al Sheikh Al Libi to death. Al Libi was a key source the George W. Bush Presidency had claimed established that Iraq had provided training to al-Qaeda in Iraq's weapons of mass destruction. December 14, 2009: In an audio recording released on December 14, 2009, al-Zawahiri renewed calls to establish an Islamic state in Israel and urged his followers to "seek jihad against Jews" and their supporters. He also called for jihad against America and the West, and labeled Egyptian president Hosni Mubarak, King Abdullah II of Jordan, and King Abdullah bin Abdulaziz of Saudi Arabia as the "brothers of Satan". June 8, 2011: al-Zawahiri released his first video since the death of Osama bin Laden, praising bin Laden and warning the U.S. of reprisal attacks, but without staking a claim on the leadership of al-Qaeda. September 3, 2014: In a 55-minute-long video, al-Zawahiri announced the formation of a new wing called al-Qaeda in the Indian Subcontinent (AQIS), which would wage jihad "to liberate its land, to restore its sovereignty, and to revive its Caliphate." Reaction amongst Muslims in India to the formation of the new wing was one of fury. In late August, 2016: A Jihadi website released series of sermons by al-Zawahiri regarding Jihad. March 2018: al-Zawahiri posts a video entitled "America is the First Enemy of the Muslims", where he defends the Muslim Brotherhood and claims that the US is "working with Saudi Arabia to train imams and rewrite religious textbooks". This is his sixth video in 2018. He refers to Rex Tillerson's firing as US Secretary of State in the Trump administration. In mid-December 2007, al-Zawahiri's spokespeople announced plans for an "open interview" on a handful of Islamic Web sites. The administrators of 4 known jihadist web sites have been authorized to collect and forward questions, "unedited", they pledge, and "regardless of whether they are in support of or are against" al-Qaeda, which would be forwarded to al-Zawahiri on January 16. al-Zawahiri responded to the questions later in 2008; among the things he said were that al-Qaeda didn't kill innocents, and that al-Qaeda would move to target Israel "after expelling the occupier from Iraq". ^ "Al-Qaeda's remaining leaders". BBC News. June 16, 2015. Retrieved April 28, 2017. ^ "Ayman al Zawahiri". Retrieved September 8, 2014. ^ Al-Zawahiri is also sometimes transliterated al-Dhawahiri to reflect normative classical Arabic pronunciation beginning with /ðˤ/. The Egyptian Arabic pronunciation is Egyptian Arabic pronunciation: [ˈʔæjmæn mæˈħæmmæd ɾɑˈbiːʕ ez.zˤɑˈwɑhɾi]; approximately: Ayman Mahammad Rabi Elzawahri. ^ a b "Ayman al-Zawahiri". FBI Most Wanted Terrorists. ^ a b "Ayman al-Zawahiri appointed as Al-Qaeda leader". June 16, 2011. Retrieved April 28, 2017 – via www.bbc.co.uk. ^ "Al Qaeda leader calls for kidnapping of Westerners - CNN.com". CNN. October 29, 2012. ^ "CNN Programs – People in the News". Retrieved April 28, 2017. ^ a b "Most Wanted Terrorists – Ayman Al-Zawahiri". Federal Bureau of Investigation, US Department of Justice. Archived from the original on December 24, 2007. Retrieved December 23, 2007. ^ Lawrence Wright (2006). The Looming Tower. Knopf. Chapter 2. ISBN 0-375-41486-X. ^ Battistini, Francesco (June 12, 2011). "La sorella del nuovo Osama: Mio fratello Al Zawahiri, così timido e silenzioso". Corriere della Sera. Archived from the original on November 5, 2012. ^ "Google Translate". Translate.google.com. Retrieved December 13, 2012. ^ "Egypt arrests brother of Qaeda chief for 'backing Morsi'". Middle East Online. Retrieved August 17, 2013. ^ a b Wright, p. 42. ^ Bergen, Peter L. (2006). The Osama bin Laden I Know. Free Press. p. 66. ISBN 978-0-7432-7891-1. ^ "Al-Qaeda Deputy Head Ayman Al-Zawahiri in Audio Recording: Musharraf Accepted Israel's Existence". Memri. Archived from the original on August 13, 2008. Retrieved February 3, 2011. ^ Wilkinson, Isambard (August 11, 2008). "Al-Qa'eda chief Ayman Zawahiri attacks Pakistan's Pervez Musharraf in video". The Daily Telegraph. London. Retrieved April 26, 2010. ^ Qutb, Milestones, pp. 16, 20 (pp. 17–18). ^ Henderson, Barney (June 8, 2012). "Al-Qaeda statement by Ayman al-Zawahiri's wife released". London: Telegraph. Retrieved December 13, 2012. ^ Intelligence report, interrogation of Abu Zubaydah, 18 February 2004. ^ "For al-Zawahiri, anti-U.S. fight is personal". CBS News. June 16, 2011. Retrieved December 13, 2012. ^ a b Saad Abedine (June 16, 2011). "Jihadist websites: Ayman al-Zawahiri appointed al Qaeda's new leader". Cable News Network. Retrieved June 16, 2011. ^ Atkins, Stephen E. (May 31, 2011). The 9/11 Encyclopedia. ABC-CLIO. p. 456. ISBN 978-1-59884-921-9. Retrieved May 6, 2011. ^ Michelle Shephard, "Guantanamo's Child", 2008. ^ John Pike. "Ayman al-Zawahiri". Globalsecurity.org. Retrieved December 13, 2012. ^ Egypt Independent (May 1, 2013). "Mohamed al-Zawahiri denies being arrested in Syria". ^ Bowcott, Owen (January 24, 2003). "Torture trail to September 11: A two-part investigation into state brutality opens with a look at how the violent interrogation of Islamist extremists hardened their views, helped to create al-Qaida and now, more than ever, is fueling fundamentalist hatred". The Guardian. London. Archived from the original on March 4, 2006. Retrieved August 29, 2006. ^ Raphaeli, Nimrod (Winter 2002). "Ayman Muhammad Rabi' Al-Zawahiri: The Making of an Arch Terrorist". Terrorism and Political Violence. 14 (4): 1–22. doi:10.1080/714005636. Cited in "Ayman Muhammad Rabi' Al-Zawahiri". The Jewish Virtual Library. March 11, 2003. Archived from the original on July 21, 2006. Retrieved August 29, 2006. ^ Wright, Looming Towers, 2006, p. 217. ^ "The Times & The Sunday Times". Retrieved April 28, 2017. ^ "Pakistan: Al-Qaeda claims Bhutto's death". Adnkronos Security. April 7, 2003. Retrieved December 13, 2012. ^ al-Shafey, Mohammed. Asharq Alawsat, Al-Qaeda's secret Emails: Part Four Archived December 9, 2012, at the Wayback Machine, June 19, 2005. ^ Sageman, Marc, Understanding Terror Networks, University of Pennsylvania Press, 2004, p. 45. ^ National Commission on Terrorist Attacks, 9/11 Commission, p. 191. ^ The Hindu, Taliban grants Osama citizenship, November 9, 2001. ^ a b Wright, p. 49. ^ Canadian Security Intelligence Service, Summary of the Security Intelligence Report concerning Mahmoud Jaballah[dead link], February 22, 2008. ^ "Читать онлайн "The Black Banners" автора Soufan Ali H. – RuLit – Страница 11". Archived from the original on April 13, 2014. Retrieved April 28, 2017. ^ "Читать онлайн "The Black Banners" автора Soufan Ali H. – RuLit – Страница 135". Archived from the original on April 13, 2014. Retrieved April 28, 2017. ^ "Egypt – Al Qaeda Chief Urges Westerner Kidnappings". April 27, 2014. Retrieved January 22, 2017. ^ a b Baldauf, Scott (October 31, 2001). "The 'cave man' and Al Qaeda". Christian Science Monitor. Archived from the original on March 28, 2008. Retrieved April 17, 2008. ^ Russian Secret Services' Links With Al-Qaeda. Axis Globe. 18.07.2005. ^ a b "Al Qaeda No. 2 Ayman al-Zawahiri calls the shots, says State Department". Daily News. New York. April 30, 2009. ^ "Osama Bin Laden was still in control, U.S. says". Politico. Washington. May 7, 2011. ^ a b Juan Zarate, Chris Wragge, CBS Early Show (May 3, 2011). Who now becomes America's next most wanted terrorist?. ^ Ackerman, Spencer (May 1, 2011). "U.S. Forces Kill Osama bin Laden". Wired News. Archived from the original on May 7, 2011. Retrieved May 2, 2011. ^ Independent Online, Egyptian surgeon named as Bin Laden's heir, September 24, 2001. ^ "Al-Qaeda: No compromise on Palestine". Associated Press. June 16, 2011. Retrieved June 16, 2011. ^ Moni Basu (June 16, 2011). "Analysis: Al-Zawahiri takes al Qaeda's helm when influence is waning". Cable News Network. Retrieved June 16, 2011. ^ a b "Gates: Al-Zawahri is no bin Laden". USA Today. Associated Press. June 16, 2011. Retrieved June 16, 2011. ^ "US vows to hunt down, kill new Al-Qaeda leader". Associated Press. June 16, 2011. Archived from the original on June 19, 2011. Retrieved June 16, 2011. ^ "US vows to 'capture and kill' Ayman al-Zawahiri". BBC. June 16, 2011. Archived from the original on June 17, 2011. Retrieved June 16, 2011. ^ "US vows to hunt down al-Qaeda's new leader". Sydney Morning Herald. June 17, 2011. Retrieved June 16, 2011. ^ a b Wright, p. 250. ^ Wright, Lawrence. "The Looming Tower: Al-Qaeda and the Road to 9/11" (PDF). Hasanuddin University. p. 279. ^ a b c Wall Street Journal, "Saga of Dr. Zawahri Sheds Light On the Roots of al Qaeda Terror". ^ Gebara, Khalil (February 10, 2005). "The End of Egyptian Islamic Jihad?". The Jamestown Foundation. Archived from the original on November 21, 2006. Retrieved December 7, 2006. ^ Naughton, Philippe (August 4, 2005). "The man they call Osama bin Laden's brain". The Times. UK. Retrieved May 3, 2008. ^ Lawrence Wright, The Looming Tower, 2006 ISBN 0-375-41486-X . ^ Interview with Usama Rushdi. Wright, 2006, pp. 124–5. ^ "Al-Zawahiri: 'Iran Stabbed a Knife into the Back of the Islamic Nation". ^ "Al-Zawahiri in Two Recent Messages: 'Iran Stabbed a Knife into the Back of the Islamic Nation;' Urges Hamas to Declare Commitment to Restoring the Caliphate". MEMRI. December 18, 2007. Archived from the original on January 9, 2008. ^ "Al-Qaeda accuses Iran of 9/11 lie". BBC News. April 22, 2008. ^ a b "Al-Qaida tape blasts Iran for working with U.S." MSNBC. Retrieved February 3, 2011. ^ a b "Search – Global Edition – The New York Times". International Herald Tribune. March 29, 2009. Archived from the original on December 7, 2008. Retrieved February 3, 2011. ^ Novikov, Evgenii (January 15, 2004). "A Russian agent at the right hand of bin Laden?". The Jamestown Foundation. Archived from the original on June 19, 2008. Retrieved April 16, 2008. ^ "Obituary: Alexander Litvinenko". BBC News. November 24, 2006. Archived from the original on March 7, 2008. Retrieved April 16, 2008. ^ Osborne, Sean (May 6, 2007). "Ayman al-Zawahiri: Echoes of Alexander Litvinenko". Northeast Intelligence Network. Archived from the original on December 7, 2008. Retrieved April 16, 2008. ^ a b Dr. John Calvert (2008). Islamism: A Documentary and Reference Guide. Greenwood Publishing Group. p. 230. ISBN 978-0-313-33856-4. ^ Aboul-Enein, Youssef H. (January – February 2005). "Ayman Al-Zawahiri's Knights under the Prophet's Banner: the al-Qaeda Manifesto". Military Review. Archived from the original on January 25, 2007. Retrieved August 29, 2006. ^ "Al-Sharq Al-Awsat Publishes Extracts from Al-Jihad Leader Al-Zawahiri's New Book". February 12, 2001. Archived from the original on July 17, 2006. Retrieved August 29, 2006. ^ David Aaron (2008). In Their Own Words: Voices of Jihad. Rand Corporation. p. 187. ISBN 978-0-8330-4402-0. ^ His Own Words: Translation and Analysis of the Writings of Dr. Ayman Al Zawahiri. Lulu.com. 2006. p. 110. ISBN 978-1-84728-880-6. ^ NA NA (2002). Islamic Fundamentalism in Egyptian Politics: 2nd Revised Edition. Palgrave Macmillan US. p. 178. ISBN 978-1-137-06931-3. ^ Gilles Kepel (2004). The War for Muslim Minds: Islam and the West. Harvard University Press. p. 95. ISBN 978-0-674-01575-3. ^ Barry Rubin; Judith Colp Rubin (2004). Anti-American Terrorism and the Middle East: A Documentary Reader. OUP USA. p. 49. ISBN 978-0-19-517659-9. ^ Alex Strick van Linschoten; Felix Kuehn (2012). An Enemy We Created: The Myth of the Taliban-Al Qaeda Merger in Afghanistan. Oxford University Press. p. 63. ISBN 978-0-19-992731-9. ^ Faisal Devji (2005). Landscapes of the Jihad: Militancy, Morality, Modernity. Cornell University Press. p. 64. ISBN 978-0-8014-4437-1. ^ Pakistan: At least 4 terrorists killed in U.S. strike – USA Today. ^ "BBC NEWS – South Asia – Pakistan rally against US strike". Retrieved April 28, 2017. ^ Associated Press, "Missile Strike On Al-Zawahri Disputed", August 3, 2008. ^ "No evidence of al Qaeda No. 2's illness or death, U.S. says". CNN. August 1, 2008. Retrieved August 2, 2008. ^ Atassi, Basma. "Qaeda chief arbitrates Syria's 'jihad crisis'". Retrieved April 28, 2017. ^ Spencer, Richard (May 19, 2013). "Syria: Jabhat al-Nusra split after leader's pledge of support for al-Qaeda". The Telegraph. London. Retrieved May 21, 2013. ^ "Iraqi al-Qaeda chief rejects Zawahiri orders". Al Jazeera. June 15, 2013. Retrieved June 15, 2013. ^ "Gulf allies and 'Army of Conquest". Al-Ahram Weekly. May 28, 2015. ^ Joscelyn, Thomas (November 2, 2015). "Al Qaeda chief calls for jihadist unity to 'liberate Jerusalem'". Long War Journal. ^ Joscelyn, Thomas (September 13, 2015). "Zawahiri calls for jihadist unity, encourages attacks in West". Long War Journal. ^ "Zawahiri endorses war in Kashmir but says don't hit Hindus in 'Muslim lands'". The Indian Express. Reuters. September 17, 2013. ^ Al-Tamimi, Aymenn Jawad (August 13, 2015). "Ayman al-Zawahiri's Pledge of Allegiance to New Taliban Leader Mullah Muhammad Mansour". Middle East Forum. ^ Paraszczuk, Joanna (August 15, 2015). "Why Zawahri's Pledge To Taliban Could Be A Boon For IS". Radio Free Europe/Radio Liberty. ^ "Al-Qaeda urges fight against West and Russia". Cairo: Al Arabiya. Reuters. November 2, 2015. ^ Mukhopadhyay, Sounak (November 2, 2015). "Al Qaeda Chief Hints Joining Hands With ISIS In War Against Russia, US". International Business Times. ^ Abdelaty, Ali; Knecht, Eric (November 1, 2015). Williams, Alison (ed.). "Al Qaeda chief urges militant unity against Russia in Syria". Reuters. ^ Zelin, Aaron Y. (November 1, 2015). "New video message from Dr. Ayman al-Ẓawāhirī: "To Unite for the Liberation of Jerusalem"". Jihadology. ^ "Caleb Weiss". Twitter. Retrieved September 23, 2015. ^ Joscelyn, Thomas (July 7, 2016). "Zawahiri praises Uighur jihadists in ninth episode of 'Islamic Spring' series". Long War Journal. Foundation for Defense of Democracies. ^ "Zawahiri Addresses Uyghur Muslims in Ninth Episode of "Islamic Spring"". SITE Intelligence Group. July 2, 2016. ^ Botobekov, Uran (September 29, 2016). "Al-Qaeda, the Turkestan Islamic Party, and the Bishkek Chinese Embassy Bombing". The Diplomat. ^ "Chinese security under threat from Islamic Uighur militancy". Associated Press. BEIJING. September 10, 2016. ^ "Şeyh Ebu Katade'den Türkistan İslam Cemaati Mücahitlerine Övgü Dolu Sözler". Doğu Türkistan Bülteni Haber Ajansı. November 2, 2016. Archived from the original on February 2, 2017. ^ Joscelyn, Thomas (February 3, 2014). "Pro-al Qaeda Saudi cleric calls on ISIS members to defect". Long War Journal. Foundation for Defense of Democracies. ^ Ibrahim, Raymond (2007). The Al Qaeda Reader. Broadway Books. p. 63. ISBN 978-0-7679-2262-3. ^ Frayer, Lauren. ""Al-Qaida's Stance on Women Sparks Extremist Debate."". Archived from the original on December 7, 2008. Retrieved 2008-05-31. CS1 maint: BOT: original-url status unknown (link) Associated Press at ABC News. May 31, 2008. Retrieved on July 17, 2011. ^ Jones, Seth G. (2012). "Think Again: Al Qaeda". Foreign Policy (May/June 2012). Archived from the original on April 28, 2012. Retrieved April 28, 2012. ^ Oliver, Mark (August 4, 2005). "Al-Qaida warns of more London destruction". The Guardian. Retrieved May 27, 2012. ^ Dodd, Vikram; Richard Norton-Taylor (September 2, 2005). "Video of 7/7 ringleader blames foreign policy". London: The Guardian. Retrieved May 27, 2012. ^ "Al-Zawahiri downplays U.S. efforts in Afghanistan". CNN. September 19, 2005. Archived from the original on July 16, 2012. Retrieved September 19, 2005. ^ "Bin Laden alive claim is from old video". London: The Guardian. December 7, 2005. Retrieved May 27, 2012. ^ "Al Qaeda No. 2: We don't kill innocents - CNN.com". Retrieved April 28, 2017. ^ "Al Qaeda message blames Obama, Egypt for Gaza violence". CNN. January 6, 2009. Archived from the original on June 5, 2010. Retrieved April 26, 2010. ^ Musharbash, Yassin (January 16, 2007). "Ask al-Qaida: A jihadi advice column? Osama bin Laden's second-in-command answers questions from fans of the terror group worldwide". Salon/Der Spiegel. ^ Christopher Henzel. "The U.S. Army Professional Writing Collection". Army. Archived from the original on August 5, 2011. Retrieved December 13, 2012. ^ "World Islamic Front Statement Urging Jihad Against Jews and Crusaders". Fas.org. Retrieved December 13, 2012. Kepel, Gilles; & Jean-Pierre Milelli (2010), Al Qaeda in its own words, Harvard University Press, Cambridge & London, ISBN 978-0-674-02804-3. Mansfield, Laura (2006), His Own Words: A Translation of the Writings of Dr. Ayman Al Zawahiri, Lulu Pub. al-Zawahiri, Ayman, L'absolution, Milelli, Villepreux, ISBN 978-2-916590-05-9 (French translation of Al-Zawahiri's latest book). Ibrahim, Raymond (2007), The Al Qaeda Reader, Broadway Books, ISBN 978-0-7679-2262-3.